The final siege of Saigon began on April 25. 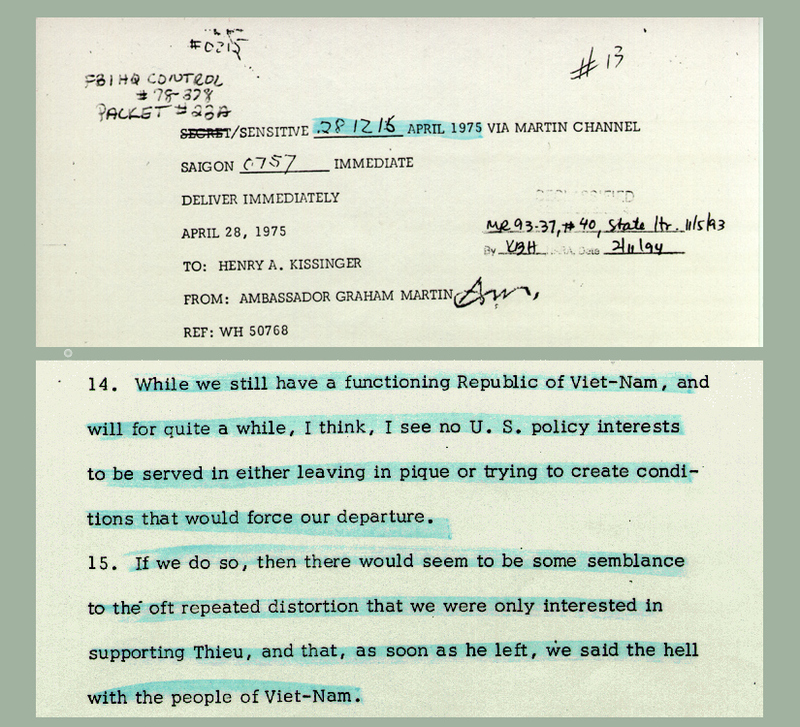 Kissinger was on the telephone to U.S. Ambassador Graham Martin several times a day, and his reports convinced me that the country was going to collapse momentarily. In the late afternoon of April 28, I was chairing a meeting of my economic and energy advisers in the Cabinet Room when Brent Scowcroft entered and handed me a note. A message had just come in to the Situation Room downstairs. Our Air Force, it said, had been forced to halt evacuation flights from Saigon because Communist rockets and artillery shells were blasting the runways at Tan Son Nhut. A C-130 transport plane had been destroyed and several U.S. Marines killed. Nearly a thousand Americans still remained in Saigon, and we had to carry out our plans to evacuate them. Leaving the Cabinet Room, I stepped into the Oval Office and discussed the crisis with Kissinger and Rockefeller. Then I convened a meeting of the NSC in the Roosevelt Room. It was 7:30 P.M. in Washington, almost dawn in Saigon. A4234-11A. President Ford presides over a meeting of the National Security Council on the situation on Vietnam. April 28, 1975. (clockwise, left to right) William Colby, Director, CIA; Robert S. Ingersoll, Deputy Secretary of State; Henry Kissinger; GRF, James Schlesinger, Defense Secretary; William Clements, Deputy Secretary of Defense; Vice President Rockefeller; and General George S. Brown, Chairman of the Joint Chiefs of Staff. A4238-15A. Vice President Nelson A. Rockefeller and General George S. Brown, Chairman of the Joint Chiefs of Staff, attend an evening meeting of the National Security Council to discuss the evacuation of Saigon. April 28, 1975. A4238-26A. Vice President Nelson A. Rockefeller listens intently to the discussion of the evacuation of Saigon during an evening meeting of the National Security Council. April 28, 1975. A4238-30A. 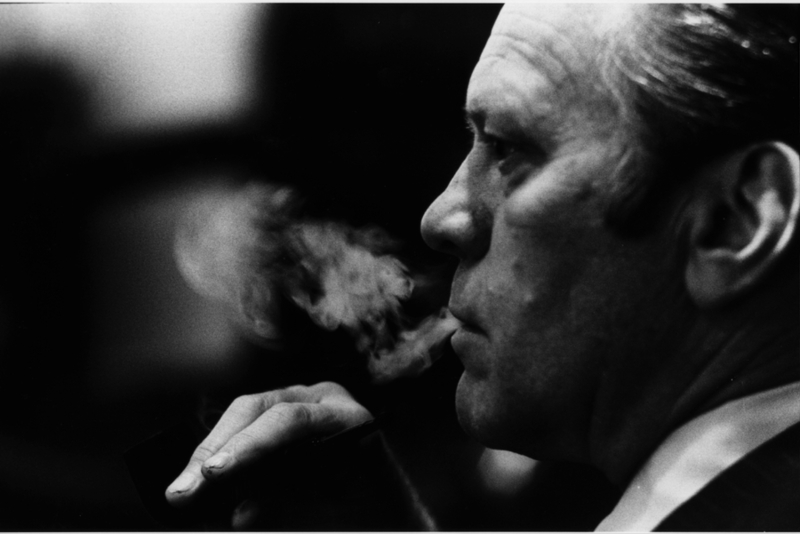 President Ford, smoking a pipe, looks thoughtful at an evening meeting of the National Security Council. April 28, 1975. It seems to me your views in reftel again assure the "worst case" development, and the time frame is far more rapid than one should expect in Asia. I still think they will opt to follow the scenario (their interpretation, of course) laid down in the Paris Agreements. There is a curious compulsion to prove they have fully intended to comply all along. Minh and Vu Van Mau who will be his Prime Minister and Foreign Minister are thinking of quickly recognizing the "PRG" as a legitimate government. If this occurs, we will have the reality of three Viet-Nams - DRV, PRG, RVN. After the cease-fire and area delimitation can come the formation of the NCNRC. My guess is that it will take at least three months to get to this point. My further guess is that it will not necessarily be a "two/thirds communist". I would expect more a 60-40 lineup in some months with the 40 percent or even less on the communist side. They are simply not in that much of a hurry. The first concentration is going to be on formation of local administrations that can begin to get the countryside under control. After all this is accomplished - a year or more - they may begin to tighten the screws on the administration of Saigon. Even here, I would judge, they will wish to show a gentle face for a while. Now all this provides time. The new administration will be counting on us, I think, to help them buy a little more time. The withdrawal of our presence in an immediate or precipitate way would almost certainly finally pull out the rug. Where does the U. S. interest lie? My own emotional inclination is to close down. But I don't really think that course will really serve U. S. national interests as well as playing it cool for a while longer. While this is not true, it saves face for Hanoi and permits them to permit a more slow liquidation by announcing it has already taken place. The GVN must be entirely of new composition. There must be no holdovers. Policy of new government must be one of reconciliation and concord. All American military personnel, or those camouflaged as military personnel, must be removed from country. All "political prisoners" must be released and civil liberties restored. The first two and the fourth are easy. We are helping them achieve the third before it can be a bargaining lever. So there should be little ban to commencement of serious negotiations. The French apparently agree with you that Paris is the preferred spot. The first item after the cease-fire may well be delimitation of areas. It would not surprise me to see a Nha Trang-Dalat-Tay Ninh line, although they may well be more harsh in their terms. One important point to remember is that the way the transition was managed leaves us no sticky problem of recognition. There has been only a change in the Chief of State. We have no more technical, legal problem than when Huong succeeded Thieu. Even Nhan Dan this morning referred to Minh as President of the Republic of Viet-Nam. Minh has sent word this morning that he does not intend to interfere with the current pace of our evacuation for a while. At five o'clock he made a very simple speech of acceptance of the powers of the Presidency. There were no anti-American overtones and twice the Paris Agreements were invoked providing the frame for "political solution" and for the spirit of reconciliation. Obviously, this airlift cannot go on forever. It is still illegal for any Vietnamese citizen to leave without official government permission. Yet we keep rubbing their noses in it a hundred times a day by comments made in Washington. I think we can simmer it down after a while and keep the airlift running for quite a while. While we still have a functioning Republic of Viet-Nam, and will for quite a while, I think, I see no U. S. policy interests to be served in either leaving in pique or trying to create condi- tions that would force our departure. If we do so, then there would seem to be some semblance to the oft repeated distortion that we were only interested in supporting Thieu, and that, as soon as he left, we said the hell with the people of Viet-Nam. We should provide a modicum of relief and rehabilitation, not to the new government, but because the people of Viet-Nam need it just now. As of now, we have 825 people assigned to the Mission. Of these 478 are in wholly security, air transport, communications, and functions, leaving only about 349 to carry on the substantive work of the Mission. To carry a minimum relief effort, and satisfy the GAO that the liquidation of previous programs was properly done, and a modicum of reporting, we cannot do with any and no less at all as long as the airlift continues. There isn't much in here that I haven't said before. You see, I don't give you anything but a considered judgement in the first place. You can take this advice or that of your WSAG colleagues who have not, it seems to me, crystal balls of the first quality. Neither do I but I do think about the questions you raise and I don't get spooked by SAM 2s, definitely identified, which turned out to be trucks loaded with logs.